Love a bit o’ lace? Well then you will love this post, because we found a bunch of lovely lace decor projects just perfect for the romantic, vintage loving decorator in all of us! I have one little bit of advice with this… it’s easy to go crazy with something as ethereal and evocative as lace… I get it. It’s why we love wedding dresses made of it! But if you go overboard with lace decor, you will lose that delicate feel and create a chaotic look reminiscent of Victorian times. Use restraint. But use it! Try out these lace projects! 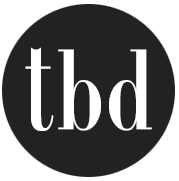 Our feature project below, is from ‘Free People Blog’. 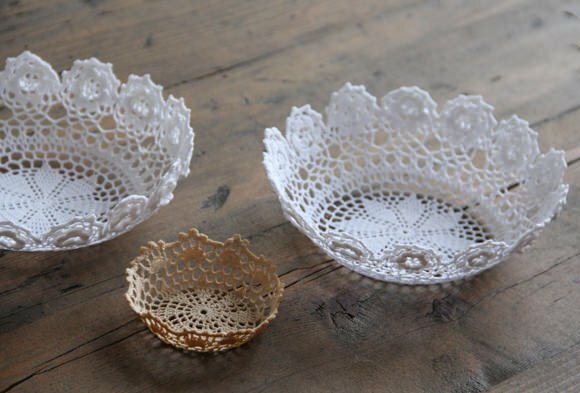 These DIY lace doily bowls are super simple to make. 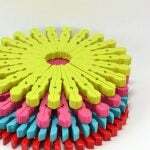 I love the idea of using these simply on their own… they don’t necessarily need to hold anything. 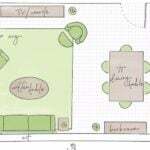 I also love the making of different sizes and displaying them in a group! Sue at ‘Uniquely Chic Furniture’ made this lace dresser with spray paint and old lace panels. You should see this dresser before! she walks you through it step by step… What a pretty piece! 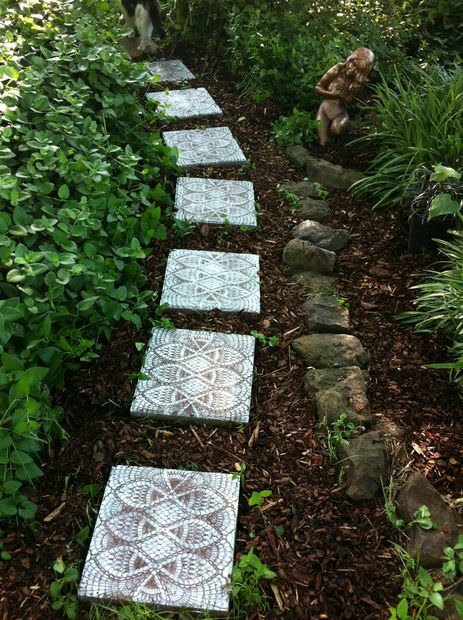 From ‘Mindful Matters’ via “Instructables’, make these DIY lace stepping stones with this easy to follow tutorial. Tons of photos, and lots of good instruction. Great way to bring lace into the garden! 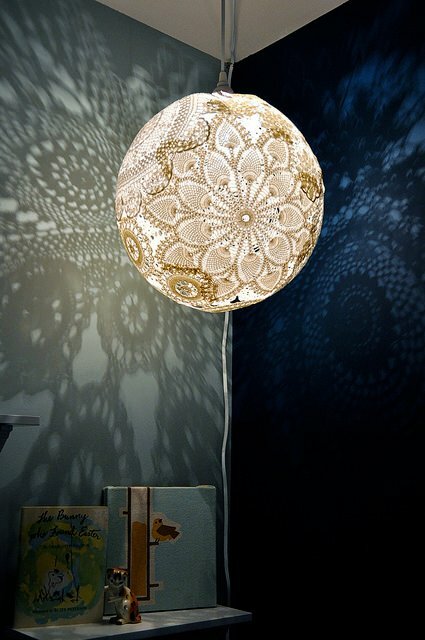 A dollar store punching bag, ordinary white glue and lace doilies are all it took for Emily at ‘Emmmy Lizzzy’ to create this DIY doily lamp… Oh. My. Precious. Can you say sweet little girls room? 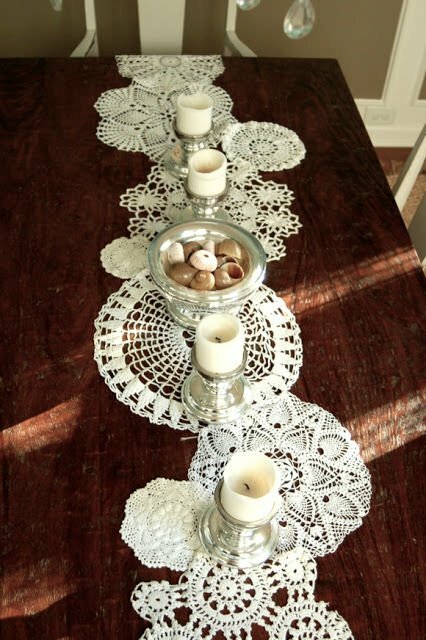 Make this DIY doily table runner with Michelle from ‘Vintage Junky’. Super, super easy. Super. Easy. Excuses? Wanna make a craft? 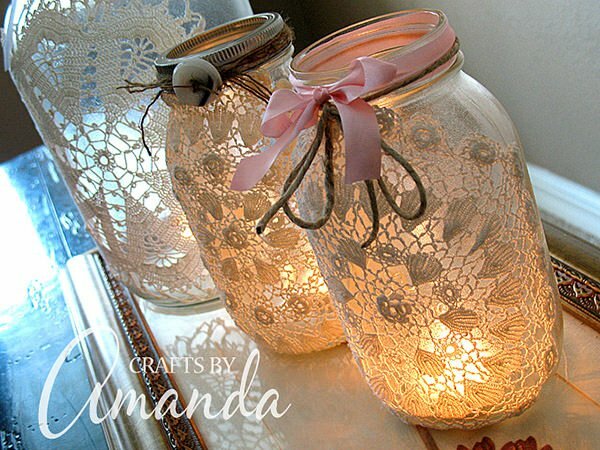 Then you need to visit ‘Crafts by Amanda’ and she can tell you how… While you are there, check out her tutorial for these amazing DIY burlap and doily luminaries. These are so romantic! 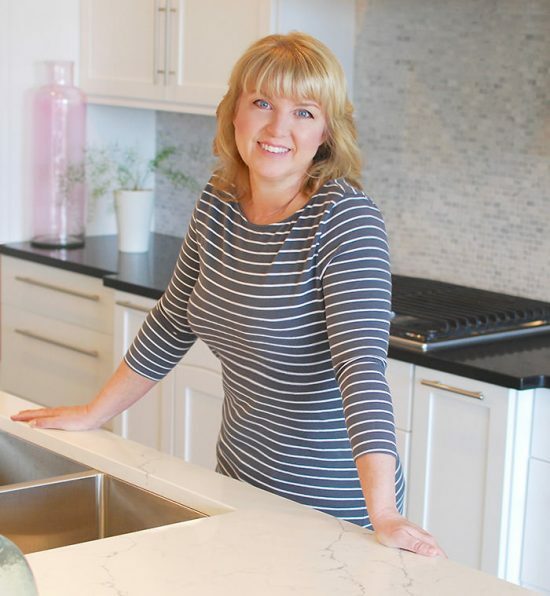 Ok, these were technically made for a wedding by Kaitlin from ‘Miss Bizy B’, but these would look great in any cottage or farmhouse style kitchen! 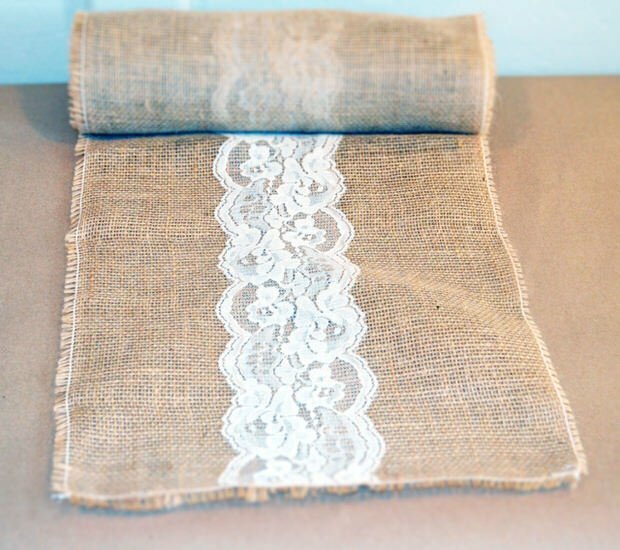 Make her burlap and lace table runners with this step by step… She even tells you where to get the supplies. 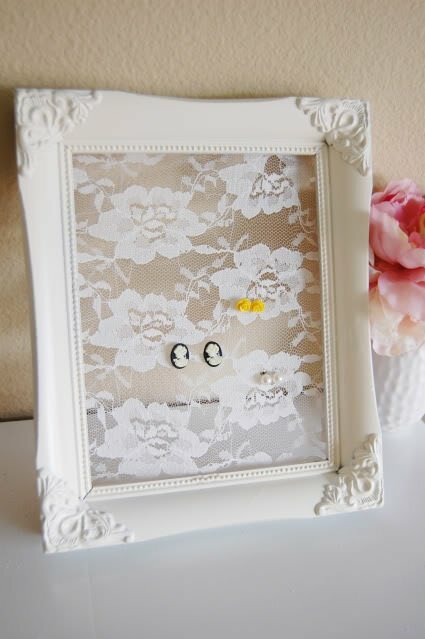 From ‘U Create’, Tanya from ‘Trey and Lucy’ shows you how to make this DIY lace earring holder with her tutorial. Personally, I think this would be pretty just hanging on the wall! 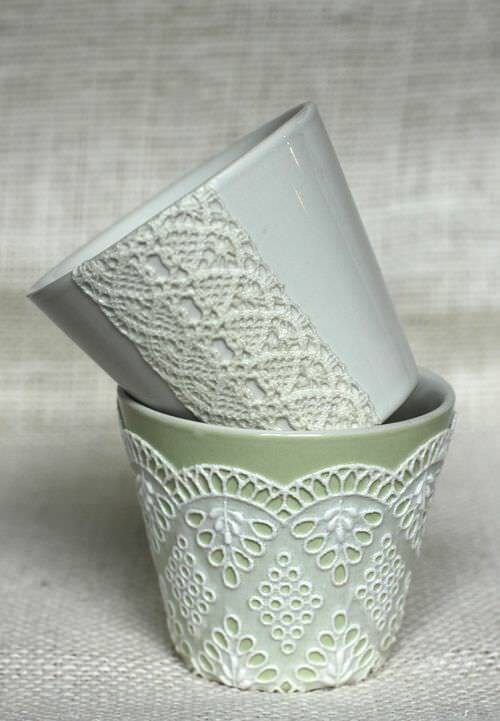 Lastly, we have this lovely decoupaging with lace project from ‘Urban Comfort’. 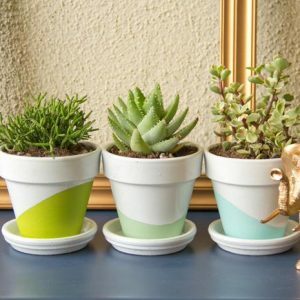 What an easy way to dress up a simple dollar store pot! 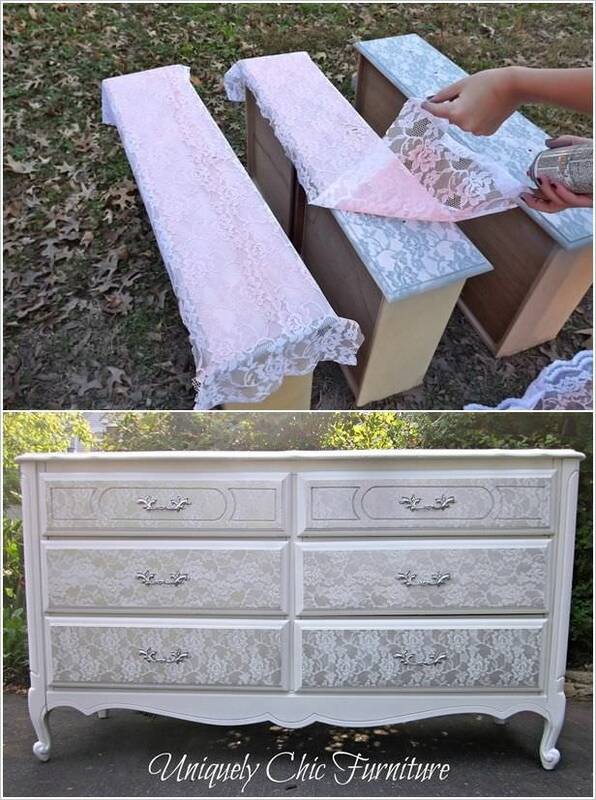 I love the idea of using lace and spray paint to decorate your dressor. It looks like it has a unique design. It’s awesome how much you can do with a little bit of lace.